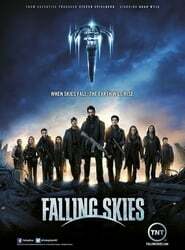 Survivors of an alien attack on earth gather together to fight for their lives and fight back.Falling Skies opens in the chaotic aftermath of an alien attack that has left most of the world completely incapacitated. In the six months since the initial invasion, the few survivors have banded together outside major cities to begin the difficult task of fighting back. Each day is a test of survival as citizen soldiers work to protect the people in their care while also engaging in an insurgency campaign against the occupying alien force. "Falling Skies S05E01 HDTV x264 KILLERS"